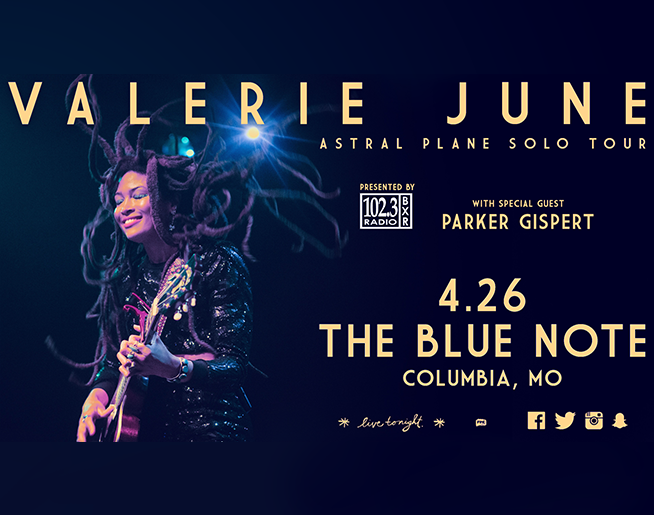 102.3 BXR is proud to present Valerie June at the Blue Note on her Astral Plane Solo Tour on April 26 with special guest Parker Gispert! One of the most admired, genre-bending artists to breakthrough in the last decade, Valerie June’s music blends southern sounds, African rhythms and ambient atmospherics into something altogether futuristic and new. Her 2017 release The Order of Time appeared on numerous ‘best of’ lists and received near universal acclaim from a broad array of international media including: Rolling Stone, New York Times, NPR, The Guardian, Vice Noisey, New Yorker, ELLE, Nylon, Garden & Gun, Okayplayer, MOJO, UNCUT, Entertainment Weekly, GQ, Exclaim!, Newsday, Afropunk, CLASH, Glide, Financial Times, American Songwriter, MTV News and many more.